An elegant and a luxurious hotel which has been designed with a lot of local art and decorated in style according to African tones is an exotic retreat for a perfect holiday. A business centre, bars loaded with the best of wines, swimming pool and a restaurant which offers local as well as international delicacies is what you can look up to during your stay. The lounge bar here gives you an extra comfort where you can relax while reading from the vast collection of books and have the traditional African coffee. The outstanding service by the hotel staff will take you to the next level of comfort. Have a delightful experience!! Create a flawless plan, make use of Arusha trip planner. 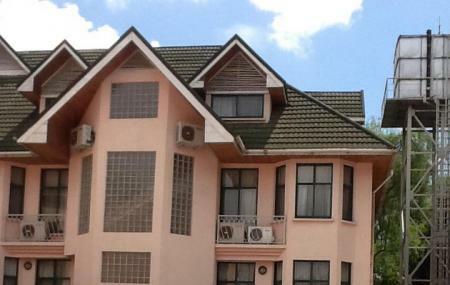 You can add cozy hotels in Arusha like Rich Hotel, Coffee Farm Guest House and Arusha Planet Lodge. Choose from variety of exclusive Arusha vacation packages for your next visit or create own own. Check out the various options for how to reach Arusha and finish off your vacation package by booking the ideal transfer. This was our 1 night pit stop before heading out on Safari. Very clean, modern hotel. The food served at dinner was average, but the breakfast was wonderful. The staff was extremely friendly, helpful, and attentive. Great, safe stay in Arusha or an overnight for Safari. FYI- at the time of our stay, they offered 2 huge amazing universal travel adapters to plug in our electronics, which was extremely helpful. The best customer service at a hotel ... ever! I've come to Arusha for many years and have had many meetings at African Tulip. Each and every time the quality and level of customer service impressed me. Then I stayed there for the first time. The rooms are really well done. Every detail has been considered. The plugs are universal with USB slots so no need to worry about those annoying adapters. There is ample water, which is always stocked in the bathroom and the refrigerator. The bed is comfortable and had really nice pillows, which is always the biggest joy for a frequent traveler. I had a lovely room with a sun bed overlooking the pool and courtyard. The food is fantastic, especially if you like Indian, which is their speciality. And that customer service! Every morning I was greeted with smiles, each waiter remembering my morning drink order and looking for extra ways to make my stay special. I told them that I never wanted to leave and that's the truth! Very good hotel! Clean, spacious and functional room and friendly service. The food was good. Recommended for a before or after safari stay. Great place to start or finish your safari trip. Top service in an accommodation with personality. Helpful staff and awesome food too. Remarkable breakfast.